The Crystal Ship incorporates the lightweight yet extremely durable U2-UFO Hyper Modular Frame with beautiful laser cut acrylic. The Acrylic is 1/4 inch thick cast. 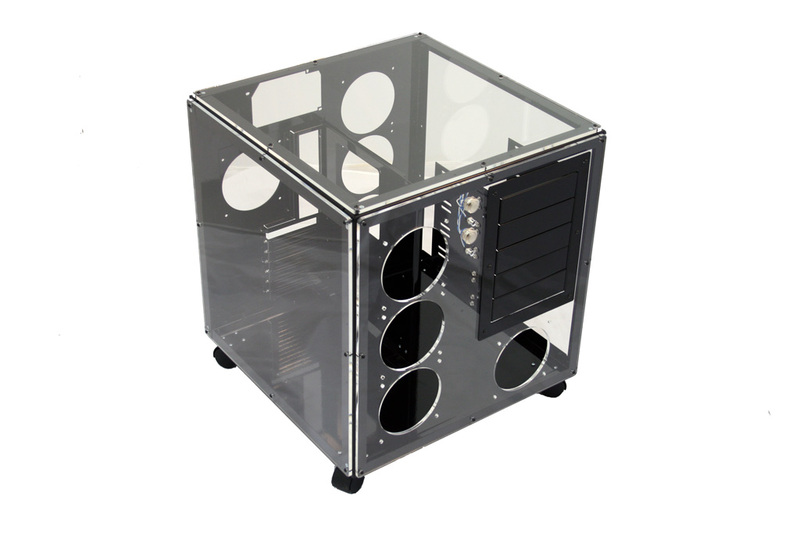 The back panel, motherboard tray, bottom panel, struts and 5.25 bays are all constructed from high grade aluminum and powder coated mirror black. The contrast of the 1/4 inch thick acrylic on the mirror black frame is stunning! The "Hybrid" combination gives you the best of both worlds; an extremely sturdy frame with the full viewing capability of an all acrylic case. It also makes this 1/2 the weight of an all acrylic case of the same size. Empty Weight - 24 lbs. When Ordering HPTX or XL-ATX motherboard tray you must also select 10PCI or 10PCI-2PSU back panels.